The Association for Public Art (aPA) invites you to our 145th Annual Meeting! This is a FREE event to celebrate the arrival of Big Bling by Martin Puryear in its new temporary location in Philadelphia. The colossal outdoor sculpture will be installed along Kelly Drive (see map) through November 2017. During the event, Puryear will be awarded aPA’s Medal of Honor, which recognizes outstanding achievement in the field of art through notable public service. BIKE / WALK – Bike or walk along the Schuylkill River Trail. Indego bike share will be offering corral service to check in and check out* bikes, so ride Indego to the event and leave the parking to them! Bike racks will also be available. *Please note that to check out an Indego bike from this event, you must be an Indego pass holder, which you can sign up for on site! More information for Indego pass types can be found here. CAR / SHUTTLE - Please park on Mt Pleasant Drive near Mount Pleasant mansion. A shuttle will pick up on the circle drive in front of Mount Pleasant (red pin) and drop off near the event (blue pin, see map). TAXI / RIDE SHARE - For safety, please arrange to be dropped off on Fountain Green Drive at the intersection of Kelly Drive (red pin) and walk to the event (blue pin, see map). 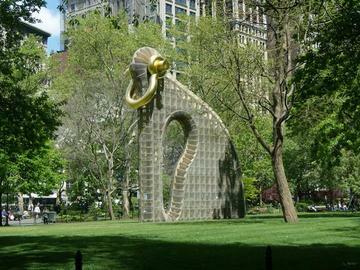 Presented by aPA, Big Bling was commissioned by Madison Square Park Conservancy’s contemporary art program, Mad. Sq. Art, and was first exhibited in Madison Square Park, New York in 2016. Visit associationforpublicart.org/bigbling to learn more.